In many schools, field trips are becoming a rare luxury. But what if there was a way to bring the excitement that students show for those real-world experiences into the classroom? An Australian organization called Scientists in Schools has flipped the field trip model, pairing volunteer scientists and mathematicians with classrooms around the country. Australian schools, like many schools around the world, don’t teach a lot of science at the primary school level. Teachers, who are responsible for covering all subjects, lack confidence when teaching science. Similarly, while there is a focus on numbers in primary grades, some of the broader elegance of math is lost. Australia performs well on international achievement tests, but its students report feeling disengaged and don’t often choose to specialize in math and science as they get older. To combat this trend, the Australian government funded Scientists in Schools to help form partnerships between practicing scientists and both primary and secondary classrooms. They hoped that by bringing a practicing scientist into the classroom students, would be able to connect their learning to its real-world application, inspiring them to pursue careers in science and math. They also hoped it would increase scientific literacy nationally and engage active scientists with the community. 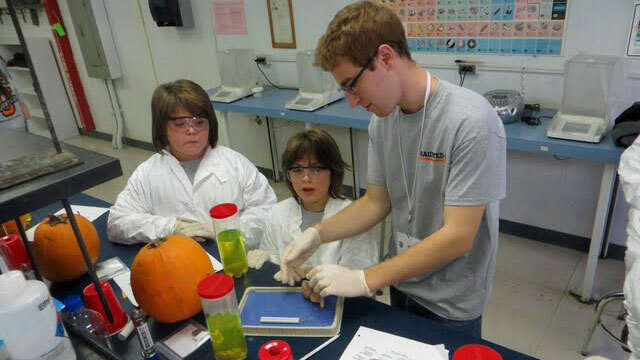 Scientists are paired with a classroom and visit several times throughout a term. They do hands on activities and demonstrations, go on field trips, host science clubs, mentor and coordinate with teachers to make sure they are contributing to the curriculum. By bringing real science into the classroom they hope to inspire both teachers and students. If a school is remote, some partnerships are conducted long-distance through video conferencing. Scientists for Schools provides funds for the scientist to visit in person at least once a year to help facilitate the relationship. Scientist in Schools has conducted several studies of the program to gauge its effectiveness, relying on in-person interviews, online surveys of teachers, students and volunteer scientists, as well as program documentation. “From our student’s point of view, they do have an increased knowledge and understanding of real world and of contemporary science,” said Marian Heard, National Programs Manager with Commonwealth Scientific and Industrial Research Organisation, Australia’s national science agency in an edWeb webinar. “Very importantly they have a lot of fun and excitement, which of course is a big motivator for students to choose science, technology, engineering and math careers.” They also report higher awareness of careers in math and science and increased ability to ask questions. Teachers also like the partnership. They liked working with scientists and felt they gained knowledge of real-world science. They felt having a scientist in their classroom benefited the students and made them feel less alone. Even the volunteer scientists reported a good experience. While it was sometimes hard for them to find time to commit to the project and it could feel intimidating to get started, most volunteers enjoyed the experience and felt they got something useful out of it. “They were able to be face-to-face discovering what people thought about the work that they did and then able to clear up misperceptions,” Heard said. They also reported feeling newly passionate about their area of expertise as they shared it with students. And, as has become a universal joke in some circles, scientists found it useful to practice communicating about their research and other science concepts clearly. They reported a new found respect for teachers after participating in the project. While the program has been successful and useful to those involved, it isn't easy to keep a partnership like this going. The Scientists in Schools organization has to do a lot of communicating with volunteers and school sites to make sure things run smoothly. Their average partnership lasts around two years, a commitment they find important for continuity. They also emphasize that it must be a flexible, dynamic relationship since school environments change. “We need to be relevant to what’s happening in the world of teaching so we aren't a burden and unappealing,” said Claudette Bateup, deputy director of Scientists in Schools. That means staying up to date on the curricula teachers are responsible for and helping them to think of ways to productively use the skills of volunteer scientists and mathematicians.